February is the beginning of spring in the Celtic calendar. If you mark the seasons by the changes in the light rather than temperature, it makes sense even here on this bitter cold New England day. The first of the month is St. Bridget's Day in Ireland where crosses are made of rushes and hung by the door to bring twelvemonth's luck. 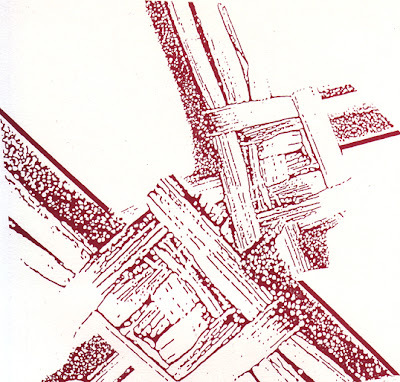 Here's a pdf of a calligraphic piece I did in 1988 about St. Bridget's cross as part of a Seasonal Celebrations series. View a traditional rush St. Bridget's cross and get directions for making one from straws here. it's summer in the southern hemisphere but it's inspirational to share your seasons this way. Thanks. I like the idea of marking the seasons with the light. I may just make that St. Bridget's cross. I remember we printed this for you a long time ago. I always liked it and still have a copy. I remember we printed this for you a long time ago. For some reason I connected with it, especially the verbiage, and I still have a copy.